Q: How much does hiring a Retro-Me photo booth cost? A: Prices are quoted on a bespoke basis due to location, booth type and event duration. Q: What do you need to confirm our booking? A: To confirm a booking we require a 20% deposit and signing of your contract. However provisional bookings are made while the details are being finalised. A: We accept all major Credit or Debit cards, cheque or BACS payment – full details are included within your contract. Q: Can we have the photo booth for more than 3 or 4 hours? A: Yes, in fact for weddings we advise 6 hours as most people tend to extend on the day if they have only contracted for 4 hours. Q: Is there a discount if I don’t want the booth for 3 hours? A: Unfortunately, no. Due to set up times, etc, 3 hours is the minimum hire time for Classic Digital booths and 4 hours is the minimum for Original Analogue booths. Q: Do you charge extra for travel? A: The first 50 miles of travel from LU5 5WZ is free. For longer distances there is a charge of £1 per mile. Q: How big are the prints? Q: How will our photos be printed? Classic Digital Booths – All photos will be printed using state-of-the-art thermal dye sublimation printers, as used by photo processing companies all over the world. These ensure all photos are delivered straight from the photo booth touch dry and waterproof in seconds. Q: Can I see sample copies before I book? A: Yes. Simply contact us and we will send you sample copies in the post. Q: Can we personalise our prints? Original Analogue Booths – No this is not possible with these booths. Classic Digital Booths – Yes, We can add your logo or a message to your prints free of charge. You will need to provide us with either an artwork file or the desired message. Q: How many photos can we take? A: There is no limit to the number of photos during the hire period. Q: Is it possible to choose between colour or black and white prints? Original Analogue Booths – No, only black and white is available. 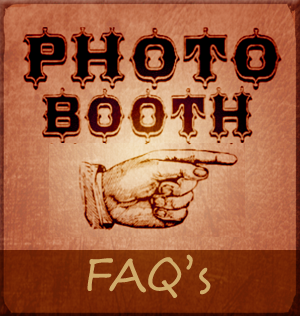 Classic Digital Booths – Yes, you can choose to print your photos in either colour, black and white or sepia finish. With the double print options you can choose to have one colour set and one black and white set. A: The Guestbook is a high quality keepsake of all photos taken at a wedding, party or event. Original Analogue Booths – With these booths we ask guests to add the first strip of photos they take to the guest book along with their message. Guests can return and take as many more photos as they like, which we then scan and add to a disk for you. This means the guests take a memento home while you have a great guest book plus a digital copy of all the images taken on the day. Classic Digital Booths – These booths are set up to print 2 copies of every strip of photos, so your guests can take one home. We put the other copy into your guest book and your guests can write their personal message to you next to it. Please see the Weddings page for more details. Q: Can you offer additional prints after our event? A: Yes, we can. We can also enlarge them. Please contact us at info@retro-me.co.uk for further details. A: Yes, after your event we will provide you with a memory stick of high-resolution copies of all the pictures taken in the photo booth. Q: How much space and which services do we need? A: We require an area of 3m x 2m with height clearance of 2.1m plus access to 240v plug socket. Q: How long do you take to set up the booth and is this included in the hire price? A: All set up costs are included in the price. The Original Analogue Booth requires a minimum of 4 hours for set up. The reason for this is that, whilst the booth itself takes just 45 minutes to set up, it takes around 3 hours for the chemicals used to process the photos to attain the correct operating temperature. The Classic Digital Booth requires just 30-45 minutes set up time. Q: Do you provide staff with the photo booths? A: Yes we supply two operatives with each booth. One is a fully qualified engineer to ensure everything works smoothly throughout your event and one supervisor – or ‘booth buddy’ – to make sure you and your guests get the most out of the photo booth experience. A: Yes, we have Public Liability Insurance cover up to £5 million. All our booths are PAT tested and we are happy to supply certificates upon request should your chosen location require them. Q: What is included in the photo booth prop box? A: Your guests have a large selection of props to play with such as hats, glasses, masks, wigs and a chalk board for scribbling quirky messages.